White-tailed deer, the smallest members of the North American deer family, are found from southern Canada to South America. Adult white-tails have reddish-brown coats in summer which fade to a duller grayish-brown in winter. Male deer, called bucks, are easily recognizable in the summer and fall by their prominent set of antlers, which are grown annually and fall off in the winter. Only the bucks grow antlers, which bear a number of tines, or sharp points. During the mating season, also called the rut, bucks fight over territory by using their antlers in sparring matches. Female deer, called does, give birth to one to three young at a time, usually in May or June and after a gestation period of seven months. Young deer, called fawns, wear a reddish-brown coat with white spots that helps them blend in with the forest. White-tailed deer are herbivores, leisurely grazing on most available plant foods. Their stomachs allow them to digest a varied diet, including leaves, twigs, fruits and nuts, grass, corn, alfalfa, and even lichens and other fungi. Occasionally venturing out in the daylight hours, white-tailed deer are primarily nocturnal or crepuscular, browsing mainly at dawn and dusk. In the wild, white-tails, particularly the young, are preyed upon by bobcats, mountain lions, and coyotes. They use speed and agility to outrun predators, sprinting up to 30 miles (48 kilometers) per hour and leaping as high as 10 feet (3 meters) and as far as 30 feet (9 meters) in a single bound. 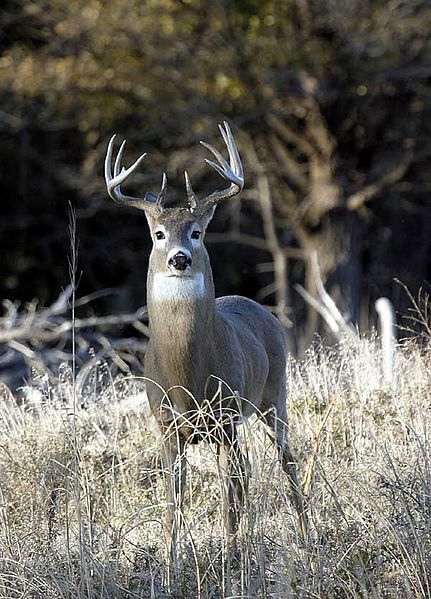 Although previously depleted by unrestricted hunting in the United States, strict game-management measures have helped restore the white-tailed deer population. Copyright © 2015 | Mayfield Ranch | All Rights Reserved.